Data is the beating pulse of business, but customer data is more like DNA. Customer data, if we’re using it right, directs how we grow and what we develop. But what happens if that customer data becomes corrupted by our own bias? We can’t grow or develop in the ways we need to. But what is bias exactly? Where does it come from? The most prevalent bias is, perhaps, confirmation bias – seeking out data that confirms our existing beliefs. In an early study of confirmation bias, young children were asked what features in a sports ball are important to the quality of a player’s serve. Some said size, others said material, some dismissed color as a factor – but once they’d made up their minds, they failed to acknowledge evidence that was contrary to their theory – or explained away evidence that didn’t fit. But what’s worse, especially for those of us using data to steer our businesses, is that confirmation bias caused them to not generate alternate theories unless someone asked them to. They missed exploring and finding other possibilities. Algorithmic bias – When the data used to teach an AI machine learning system reflects the implicit values of the humans involved in collecting, selecting and using that data. You might remember the 2015 uproar around Google’s image recognition AI algorithm that auto-tagged photos of black people as gorillas? Yes, that happened. And in 2009, Nikon’s image recognition algorithms consistently asked Asian users if they were blinking. Survivorship bias – When the data analyzed only comes from success stories. Sample bias – When the population you collect data from doesn’t accurately reflect the population you’re trying to learn about. Avoiding bias when gathering, analyzing and acting on data is impossible. 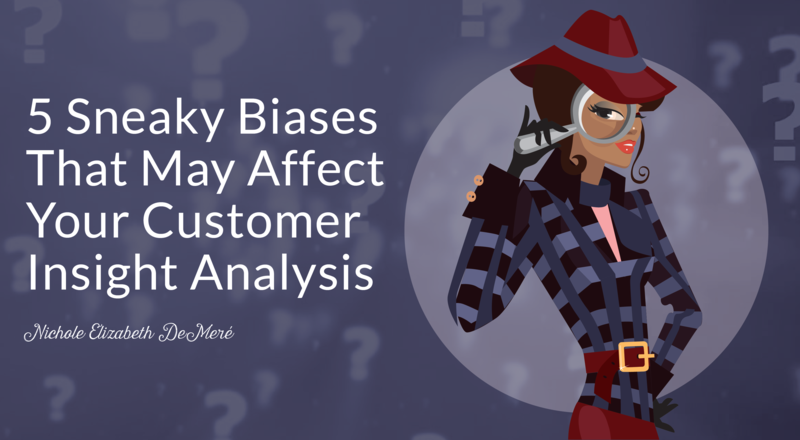 Bias creeps in with assumptions, instincts, guesses, and ‘logical’ conclusions – and mostly, we don’t even know they exist until someone without those particular biases point them out. But, while we can’t escape biases, we can try our best to account for them when we collect, analyze and interpret data.